action-RPG Vampyr continues to receive ongoing support, as the difficulty modes update releases today on PlayStation 4, Xbox One and PC. There’s never been a better time for players to sink their teeth in to the dark streets of London. In addition to the new difficulty modes, the update introduces a host of optimization tweaks and fixes. Nvidia Ansel will also be made available for PC, which allows players to capture beautiful in-game screenshots, viewing and sharing them in 3D on mobile phone, PC or VR Headset. 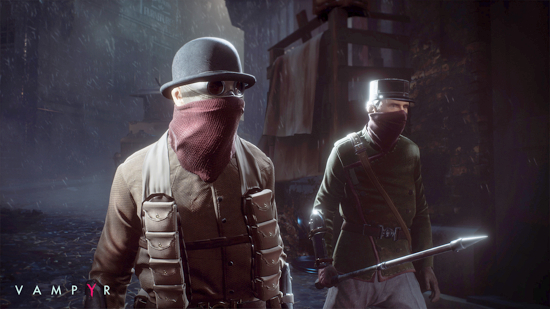 Prowl the disease ridden streets in Vampyr - a darkly atmospheric action RPG from the studio behind ‘Remember Me’ and ‘Life is Strange’, developed using Unreal Engine 4. Set in early 20th century Britain during a bout of the lethal Spanish flu, the streets of London are crippled by disease, violence and fear. In a completely disorganised and ghostly city, those who are either fools, desperate, or unlucky enough to walk the streets lay prey to Britain’s most elusive predators: the Vampires. Emerging from the chaos, a tormented figure awakes; as the player it is you who determines how to harness your new powers, by specialising in deadly, versatile RPG skill-trees that change the way you play. As a doctor recently turned into a Vampire, you try to understand your new affliction. Your quest of intuition, discoveries and struggles, will be filled with death and drama, while your attempt to stem the irrepressible thirst that constantly drives you to take human lives. As you cling to what remains of your humanity, your decisions will ultimately shape the fate of your hero while searching for answers in the coughing, foggy aftermath of the Spanish Flu.